Need to create a project schedule? 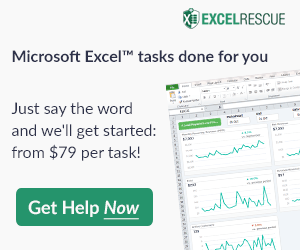 Try our Gantt Chart for Excel! As a freelance business owner, one of the first things you'll want to work out is how you will invoice your clients! After all, the success of your business depends on getting paid for the products or services you offer – and invoices are necessary to keeping track of who owes you and how much. All freelance business owners need a method for creating invoices which does not consume a lot of time to create, and that produces a professional looking document to send to clients. As you grow your business, you will find there are many administrative tasks that must be done to keep your freelance business running smoothly – from client communication to invoicing and marketing. Unfortunately, while there is no getting around these necessary business tasks, they are not the tasks which actually generate income for your business. To become successful in your freelance business, you'll need to minimize the time spent on these non-income generating activities, so you can focus on the products or services your business offers that do generate income! You could work with multiple clients each week, or even more than one client on a daily basis. If you are creating an invoice from scratch for each client, and each individual project you complete, you're spending far too much time on the task. Sending the invoice to the client is how you'll get paid for the work; but the hour spent creating a new invoice for each client is unpaid time that you could put to better use on a paying assignment. One of the most effective ways to reduce the time spent invoicing your clients is to use an invoice template designed for freelance businesses. Vertex42's Free Invoice Template (see the screenshot on the right) works great. An invoice template will allow you to quickly add the details of the company or person you are billing, as well as the description of the products and/or services you provided and how much they cost. If you are using a spreadsheet template, then it can automatically add up each line item to get the total amount your clients owe. In just a few minutes time, you can have a professionally designed invoice that is accurate and portrays a consistent image of your company to your clients. A quality invoice template will also allow you to indicate whether each individual item on the invoice should be taxed or not – so that you can easily charge for both labor and products in the event that you are a business that must charge for products separate from the service you provide. Time is money for freelance business owners. Finding ways to work smarter instead of working harder will save you both time and money and allow you the time you need to focus on the income generating activities of your business. Debbie Dragon is a freelance writer and co-owner of two content writing and marketing companies, Trifecta Strategies, LLC (TrifectaLLC.com) and ReliableWriters.com. Hi, im about to do my first design as a freelance but not sure how to do my invoice and saw this one. Dont I need an ABN? I cant see in some templates why they dont have it. Do I actually need to get it as a freelancer? I’d recommend getting advice from your accountant, as it appears there are some issues to consider. If you need to add your ABN to the invoice, you can add “ABN: [thenumber]” somewhere in the header like under your address or something (a very easy addition to almost any invoice template). What Would You Like to See Added to Vertex42? Gantt Chart FAQ – Have a Question Prior to Ordering? Vertex42® is a registered trademark of Vertex42 LLC. Microsoft® and Excel® and Word® are registered trademarks of Microsoft Corporation. Vertex42.com is not associated with Microsoft.